The rules for when to capitalize are numerous. Below you’ll find the basics. If you come across a situation I haven’t covered, please be so kind as to tell me in the comments; I’ll be happy to include more rules if they will be helpful. 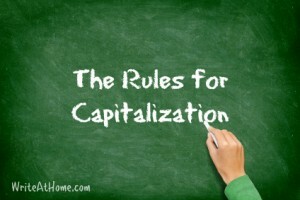 Note: Be aware that when we say capitalize, we mean “capitalize the first letter of.” It’s therefore redundant to say, “Capitalize the first letter of the word.” To indicate that all the letters of a word are made capital, we would say it is written “in all capitals” or “in all caps” for short. I said I would write soon and I did. O, my beloved hamster, you are so furry. It’s not necessary to capitalize the interjection oh, unless it starts a sentence or stands alone as a sentence. Capitalize: Oh, now I understand! Capitalize: Oh! The party is on the roof! Don’t Capitalize: But, oh, her memory lingers. Nouns that name particular people, places, and things are called proper nouns and should be capitalized. Common nouns, naming general people, places, and things, should not be capitalized. Sometimes words become so common that they are no longer associated with the proper noun. These words are not capitalized. That’s why we don’t capitalize french fries. Click Here to Check Out WriteAtHome! 1) Capitalize the first letter of the first and last word, including subtitles. 2) Capitalize all words other than articles, short prepositions*, and conjunctions. *Authorities differ on prepositions in titles. Some capitalize prepositions of five or more letters. The AP capitalizes if they have four or more. The MLA doesn’t capitalize any mid-title prepositions regardless of length. We’ll leave this decision up to you. In formal writing, avoid using all capitals to emphasize a word or phrase in your writing. Wrong: Then I noticed he had pulled the WRONG TOOTH! Right: Then I noticed he had pulled the wrong tooth! Don’t capitalize random or arbitrary letters or words. Some students, when handwriting, like to make certain letters capital all the time. In formal writing, always follow capitalization rules. I saw my cousiN yesterDay at the Bakery. Do not capitalize the names of the seasons. Do not capitalize geographical directions unless referring to a known region. Capitalize titles when used before a name or for titles of great importance. Not Capitalized: Peter is my favorite uncle. My dad can beat up your dad. Capitalized: I can’t wait to see Uncle Peter. I’m telling Dad about this. Do not capitalize terms denoting academic years. Do not capitalize names of academic subjects except for languages and when giving the title of a specific course. Capitalize the words Bible, Scripture, and the titles of other sacred works, but not the adjectives biblical or scriptural. I am trying to read through the Bible this year. I wonder what the Koran has to say about it. He made several biblical references. When I pray to God, I feel like he is listening. The Lord is seated on his throne. It is common in informal contexts like text messaging and social media posting to skip capitals altogether. This is often fine – as long as you remember your audience and the context of your communication. Some adults, educators, or business people may prefer that even informal communications follow capitalization conventions. Keep in mind that public forums like social media sites can be viewed by anyone. It is increasingly common, for example, for college admissions officers and employers to view the social media pages of applicants. When you post online, remember that your audience may be broader than you intend. Be careful how you present yourself. If anything needs clarification, or if you have a question about capitalization not answered above, please leave a comment below! Thanks for this helpful list, as well as answering the unusual questions in the comments! I have one of my own to add. In popular writing, the prefix “eco” seems to be tacked on to everything, Eco-friendly, Eco-savvy, anything you can think of. Even as I write this question, my autocorrect is trying to capitalize every instance, but is this correct? When should this prefix be capitalized, and when can it just remain a lower-case instance. On a slightly different note, do you have rules for when a hyphen should be used and when it should be avoided with the “eco” prefix? It’s used in so many ways these days it seems to confound the usual hyphen rules! Great page, I found it to be very helpful as I wrote a short story about my workplace.. In editing the following, I believe the word “scripture” should be lowercase. Do you agree? If we were talking about “the Scripture” (the Bible) I would automatically capitalize. “Remember the prisoners as if chained with them -those who are mistreated- since you yourselves are in the body also” (Hebrews 13:3). We don’t take this Scripture lightly. I agree, Brenda. I usually capitalize Scripture when speaking generally about the Bible. One wouldn’t capitalize the word verse here, and that’s what the writer means. There is some disagreement on issues like this, however, as some writers capitalize words related to God and the Bible as a way of showing honor (rather than for strictly grammatical purposes). My church tends to capitalize even pronouns referring to God on song sheets and such. I think it’s unnecessary, but as long as they are consistent, it doesn’t bother me. Thank you for this Brian. God bless! This is a great resource! Thank you so much. Should “bible” be capitalized in this usage? Thank you ever so much. It’s a breath of fresh air to have clarity on these topics. Did some research. Fowlers’s says lowercase in this usage. The AP stylebook agrees. What source do you use as your standard for style rules? Do most of the rules listed here come from that source, or are they a mashup of rules you’ve accumulated from various sources? I consulted a variety of sources. Great information. It was very interesting and informative. Do they still teach this in school? I’m sure it depends on the school, Evelyn. Thanks for your nice comments. What is the rule here? I went to The Louvre museum in Paris, France. It would depend on whether museum is part of the name or not. In this case, you could probably leave off museum altogether and say … The Louvre in Paris, France. Museum is a description of the place and is unnecessary. You can use a similar attraction to determine whether to use museum or not, i.e. would you say, “I went to the Arc de Triomphe monument” or “I wen to the Arc de Triomphe”? Hope that helps. I’ve always had a hard time with capitalization rules, so this is helpful. Glad I could help, Amanda! This is the best, most thorough list I’ve read in some time. Thanks, Rhonda. Let me know if there’s something I should add though. Leave a Reply to Rhonda Barfield Click here to cancel reply.